Fresh Air Exchanges: 0-1 per hour. Fresh Air Exchanges: 1-2 per hour. Fresh Air Exchanges: 1-2 per hour or as required. a. Hardwood logs are inoculated with dowels or sawdust and laid horizontally side by side. The logs are then partially buried using untreated sawdust. b. A rooted stump, preferably oak or chestnut, may be inoculated with dowels or sawdust.Indoors: Sterilized blocks of sawdust may be used for indoor cultivation. The exhausted blocks may be buried outside to produce additional fruits or may be used as spawn for inoculating stumps and logs. Suggested Agar Culture Media: MYPA, OMYA, PDYA, DFA. 1st, 2nd, and 3rd Generation Spawn Media: Grain. Sawdust may be substituted for grain for the 3rd generation. Substrates for Fruiting: Supplemented alder, chestnut, poplar, hickory, cottonwood or oak sawdust, logs and stumps. Additional Notes: Hypholomas thrive in cold weather and do not produce when temperatures exceed 60-65 F. ( 15-18 C.). 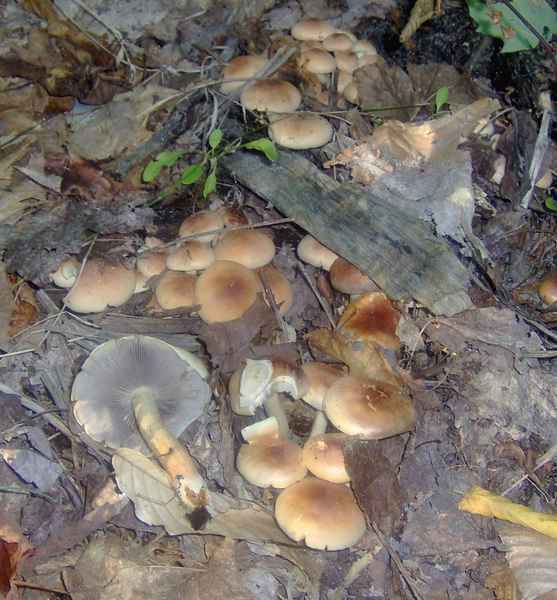 Hypholoma species are closely related to Psilocybe and Stropharia species. H. sublateritium clusters are found on dead hardwoods, logs and soils rich in wood debris, and most often found on Oak stumps. Kuritake has a nutty flavor and pairs well with red wines.